Rose Wallick is a Hydrologist and Geomorphologist who joined the U.S. Geological Survey's Oregon Water Science Center in 2007. Beginning in fall of 2014, Rose is also the Supervisor of the ORWSC Geomorphology Team. Her research draws upon geomorphic mapping, hydraulic modeling, sediment transport analyses and historical datasets to assess channel response to natural and anthropogenic influences. While she has worked throughout Oregon, Rose's recent research is focused in the Willamette Valley where she is leading a major geomorphic mapping study and previously led a multidisciplinary effort summarizing geomorphic and riparian vegetation processes of the present-day floodplain. Rose has also played a key role in the environmental flow research and monitoring projects for the Willamette Sustainable Rivers Program. In these and other projects, Rose collaborates closely with the restoration community and the many ecologists, fish biologists and other geomorphologists active in the basin. She received her B.Sc. in Watershed Science from Colorado State University and a dual M.S. degree from Oregon State University in Geology and Bioresources Engineering. Prior to joining the USGS she worked as a hydraulic engineer developing 1D and 2D river models for DHI, Inc.
Jones, Krista L.; Wallick, J. Rose; O'Connor, Jim E.; Keith, Mackenzie K.; Mangano, Joseph F.; Risley, John C., 2011. 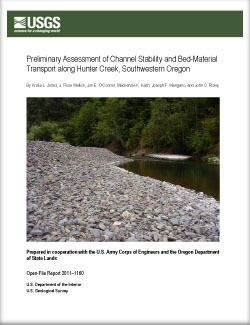 Preliminary assessment of channel stability and bed-material transport along Hunter Creek, southwestern Oregon. U.S. Geological Survey Open-File Report 2011-1160, vi, 41 p.
Wallick J.R., and Randle, T., 2009, Assessing sediment-related effects of dam removals, Meeting Report for Subcommittee on Sedimentation: Sediment Management and Dam Removal Workshop; Portland, Oregon, 14-16 October, 2008. EOS Transactions of the American Geophysical Union, 90(17): 147. Major, J.J., O’Connor, J.E., Grant, G.E., Spicer, K.R., Bragg, H.M., Rhode, A., Tanner, D.Q., Anderson, C.W., Wallick, J.R. 2008. Initial fluvial response to the removal of Oregon's Marmot Dam. EOS Transactions of the American Geophysical Union, 89(27): 241-252. 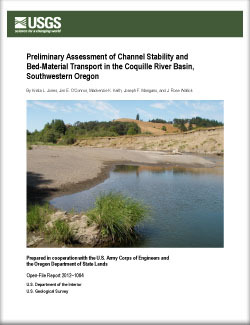 Wallick, J.R., Grant, G.E., Lancaster, S.T., Bolte J.P., and Denlinger, R.P., 2007, Patterns and controls on historical channel change in the Willamette River, Oregon in Gupta, A.V., ed, Large Rivers: Geomorphology and Management, John Wiley and Sons, Chinchester, p. 491-516. Wallick, J.R., Lancaster, S.T., and Bolte, J.P., 2006, Determination of bank erodibility for natural and anthropogenic bank materials using a model of lateral migration and observed erosion along the Willamette River, Oregon, USA. River Research and Applications, v. 22, p.631-649. Wallick, J. Rose; Bach, Leslie B.; Keith, Mackenzie K.; Olson, Melissa; Mangano, Joseph F.; Jones, Krista L.
Wallick, J.R., Bach, L.B., Keith, M.K., Olson, M., Mangano, J.F., and Jones, K.L., 2018, Monitoring framework for evaluating hydrogeomorphic and vegetation responses to environmental flows in the Middle Fork Willamette, McKenzie, and Santiam River Basins, Oregon: U.S. Geological Survey Open-File Report 2018–1157, 66 p., https://doi.org/10.3133/ofr20181157. Anderson, Scott W.; Keith, Mackenzie K.; Magirl, Christopher S.; Wallick, J. 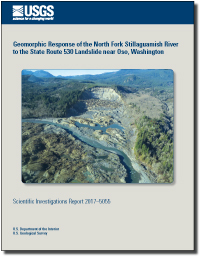 Rose; Mastin, Mark C.; Foreman, James R.
Anderson, S.W., Keith, M.K., Magirl, C.S., Wallick, J.R., Mastin, M.C., and Foreman, J.R., 2017, Geomorphic response of the North Fork Stillaguamish River to the State Route 530 landslide near Oso, Washington: U.S. Geological Survey Scientific Investigations Report 2017–5055, 85 p., https://doi.org/10.3133/sir20175055. 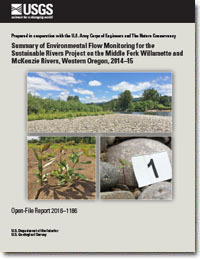 Jones, K.L., Mangano, J.F., Wallick, J.R., Bervid, H.D., Olson, Melissa, Keith, M.K., and Bach, Leslie, 2016, Summary of environmental flow monitoring for the Sustainable Rivers Project on the Middle Fork Willamette and McKenzie Rivers, western Oregon, 2014–15: U.S. Geological Survey Open-File Report 2016-1186, 91 p., http://dx.doi.org/10.3133/ofr20161186. O'Connor, James E.; Mangano, Joseph F.; Anderson, Scott A.; Wallick, J. Rose; Jones, Krista L.; Keith, Mackenzie K.
Wallick, J. 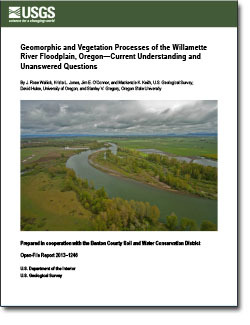 Rose; Jones, Krista L.; O'Connor, Jim E.; Keith, Mackenzie K.; Hulse, David; Gregory, Stanley V.
Geomorphic and vegetation processes of the Willamette River floodplain, Oregon: current understanding and unanswered science questions; 2013; OFR; 2013-1246; Wallick, J. Rose; Jones, Krista L.; O'Connor, Jim E.; Keith, Mackenzie K.; Hulse, David; Gregory, Stanley V.
Risley, John C.; Wallick, J. 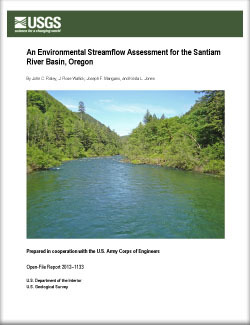 Rose; Mangano, Joseph F.; Jones, Krista L.
An environmental streamflow assessment for the Santiam River basin, Oregon; 2012; OFR; 2012-1133; Risley, John C.; Wallick, J. Rose; Mangano, Joseph F.; Jones, Krista L.
Major, Jon J.; O'Connor, Jim E.; Podolak, Charles J.; Keith, Mackenzie K.; Grant, Gordon E.; Spicer, Kurt R.; Pittman, Smokey; Bragg, Heather M.; Wallick, J. 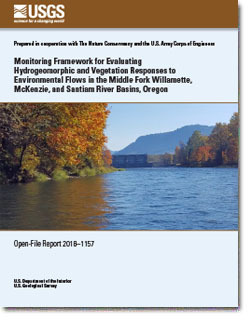 Rose; Tanner, Dwight Q.; Rhode, Abagail; Wilcock, Peter R.
Geomorphic response of the Sandy River, Oregon, to removal of Marmot Dam; 2012; PP; 1792; Major, Jon J.; O'Connor, Jim E.; Podolak, Charles J.; Keith, Mackenzie K.; Grant, Gordon E.; Spicer, Kurt R.; Pittman, Smokey; Bragg, Heather M.; Wallick, J. Rose; Tanner, Dwight Q.; Rhode, Abagail; Wilcock, Peter R.
Wallick, J. 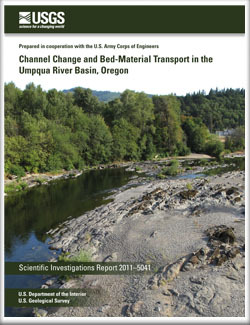 Rose; O'Connor, Jim E.; Anderson, Scott; Keith, Mackenzie K.; Cannon, Charles; Risley, John C.
Channel change and bed-material transport in the Umpqua River basin, Oregon; 2011; SIR; 2011-5041; Wallick, J. Rose; O'Connor, Jim E.; Anderson, Scott; Keith, Mackenzie; Cannon, Charles, Risley, John C.
Jones, Krista L.; Wallick, J. 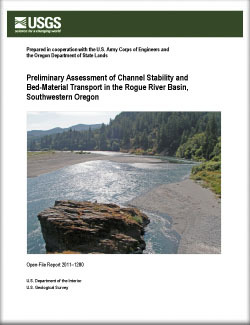 Rose; O'Connor, Jim E.; Keith, Mackenzie K.; Mangano, Joseph F.; Risley, John C.
Preliminary assessment of channel stability and bed-material transport along Hunter Creek, southwestern Oregon; 2011; OFR; 2011-1160; Jones, Krista L.; Wallick, J. Rose; O'Connor, Jim E.; Keith, Mackenzie K.; Mangano, Joseph F.; Risley, John C.